Racquetball and squash are both racket sports played indoors in closed rooms, but follow different sets of rules, and require different equipment. Both require agility, speed, coordination, and quick movements and changes of direction. Playing either sport consistently will yield a range of fitness benefits, including increased cardiovascular health, endurance, and muscle strength. Racquetball uses a larger ball with much more bounce than a squash ball. Because squash balls bounce much less than racquetballs, play in squash tends to be much faster. You have less time to get to the ball in this sport. Racket size also varies between squash and racquetball. You use a longer and narrower racket in squash than in racquetball. Squash courts have shorter and wider dimensions than racquetball courts. Standard racquetball courts measure 20 feet wide, 40 feet long and 20 feet high. Standard squash courts measure 32 feet long, 21 feet wide and 15 feet high at the tallest in-bounds point. Unlike racquetball courts, squash courts have an out-of-bounds line along the front wall, diagonal out-of-bounds lines along the two side walls, and an out-of-bounds tin strip at the base of the front wall. You cannot hit the ceiling in squash; you can in racquetball. You get two serves in racquetball and only one in squash. 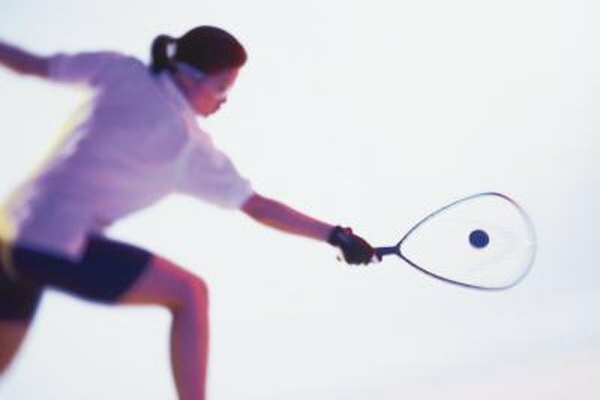 In squash, you must hit the ball from the air to serve; in racquetball, you must hit it after bouncing it on the floor. The squash serve must hit the front wall above the service line, then bounce behind the short line on the floor. In racquetball, the serve must hit the front wall, then bounce behind the short line on the floor. In both sports you must stand in a service zone or box to serve. You must score 11 points to win a game in squash, and you must win three games to win the match. In racquetball, you must win 15 points to win a game, and you must win two games to win the match. In a third “tiebreaker” game, you only need to reach 11 points to win. In racquetball, you can only win points on your serve, while in squash you can win points on your serve and your opponent’s serve.